Mt. Emei stands in Emei City of Sichuan Province. It is a mountainous scenic area demonstrate, both nature and Buddhist culture. Mt. Emel is famous far its unique geographic conditions, majestic scenery, unusual geological features and ecology. Situated at the transition belt of the ecological cones, it is home to 3,200 species of plants and 2,300 types nranimals. Golden Top, the main peak, stands 3,077 meters above sea level and offers a spectacular view of the sunrise, the sea of clouds, the Buddhist golden rays and the sunset. The Elephant Washing Pool, Jiulao Cave, and pongchun Platform are the main tourist attractions and are hidden within the remote forests. Over the last 2,000 years, the mountain has created and accumulated a rich cultural heritage based on Buddhism. The Wannian Monastery is a brick structure without any support beams. It houses a bronze statue of Samantubhadra cast in 980. The statue weighs 62 tons, stands 7.85 meters high and is counted among the important cultural relics under state protection. The Baoguo Monastery is the main venue of Buddhist activities in the area. The Fuhu Monastery is quiet, circled by towering Nanmu trees and the largest in the area. Mt. Emei has a high value for historical study, aesthetics research, scientific publicity and sightseeing. Programs have been developed that offer tourism conveniences while protecting the natural and ecological resources the l0-hectare monkey zone was established near Elephant Trunk Rock and recently opened to visitors. Also two hot spring sanitariums have been built, one in Huangwan (Yellow) Crook and the other in Meizi (Plum) Crook, and will be put into operation soon. The Warne (Ten Thousand Buddhas) Peak, the highest, has been developed as a highland ecological district to demonstrate a mysterious world to tourists. 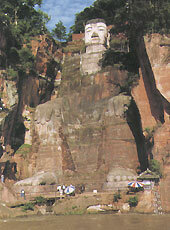 The Giant Buddha of Leshan stands opposite Mt. Emei. This Leshan scenic area covers an area of 2.5 square kilometers with the Buddha at its cenler. The Buddha was carved on a precipice during the Tang Dynasty and is accompanied by other cultural and historical spots, such as the Han hanging coffins, Buddhist statues, pavilions and temples from the Tang and Song dynasties, and buildings from the Ming and Qing dvnashes the Giant Buddha of Leshan is 71 meters tall and carved from the cliffs of pudum Peak. The austere image faces three rivers. It demonstrates excellent craftsmanship. Along the walls at its base are 900 stone Buddhas dating to the Tang Dynasty. These have high value far study and are a popular attraction for both domestic and foreign tourists.